COSO Media launched the new Stark Parks website. 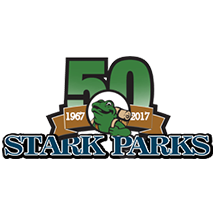 Stark Parks is a non-profit organization dedicated to promoting the development and use of Stark County Park District parks & trails. This organization works to ensure the long-term viability of the Park District through annual fundraising activities and the passage of levy initiatives. 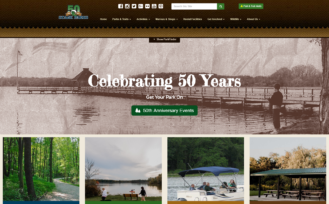 COSO Media collaborated with Stark Parks and together we made it our goal to release the new website on their organization’s 50th anniversary to celebrate. The new website's design was focused on creating a modern theme with earth tones and subtle textures to provide an outdoor look. The greens, browns, and blues throughout the website are reflected in their branding and logo. The website also has photos that visually showcase all their parks, trails, and facilities. 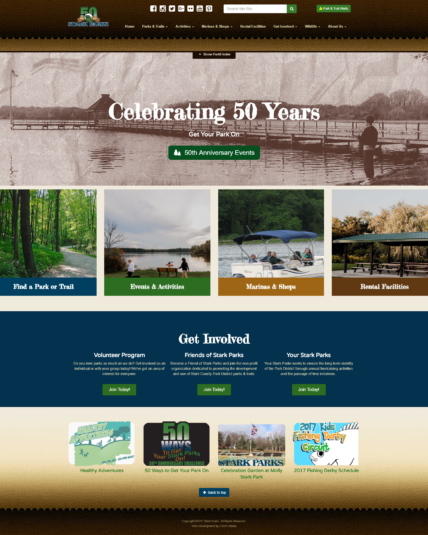 The main features on the new website is the park location finder, event calendar, program and events volunteer registration, career application, rental equipment locator, donation center for the Friends of Stark Parks organization, local wildlife education, and parks and trail alert system. 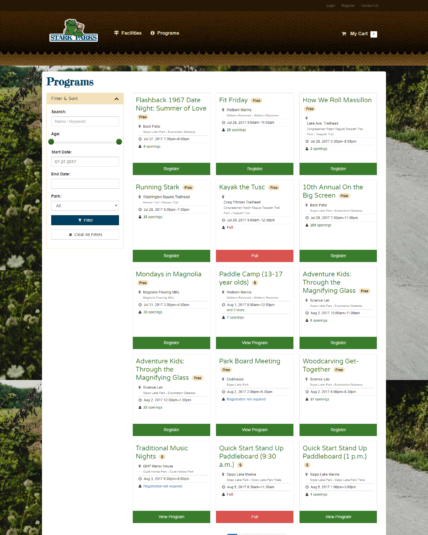 The Stark Parks reservation system was the main component for the new website since our goal was to provide the community with an easy way to register and pay for the available programs and facilities. The new website is deeply integrated with a reservation system that allows users to view and register for programs and have the ability to make payments, all within the website. 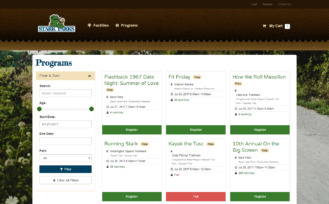 This reservation system also allows users to see which programs are full or how many openings are left. If the program is full, users are unable to register. Users can add participants to the registration, sign their waiver, and securely check out. For users to reserve a facility, they are prompted to login in order to make their reservation.